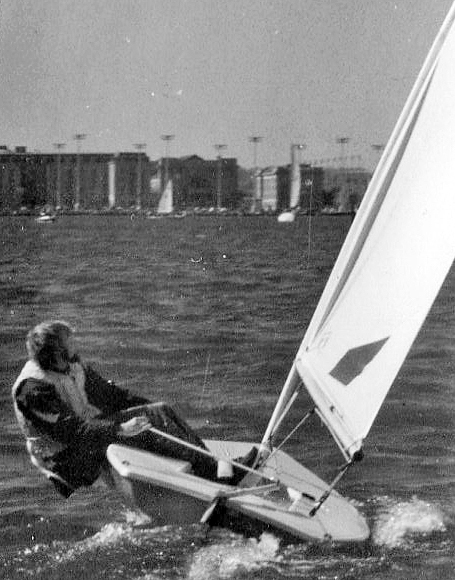 As far as I know this is the first sailboat to be featured twice in a header photo. This is Bertrand Warion's Mariposa, a French design Classic Moth with the sauciest sheer (hence the most photogenic) of all current Classic Moths. (Plus I'm partial to lime green as a hull color.) This is the second iteration of Mariposa. Bertrand Warion decided to change the interior of the original Mariposa over to a double bottom (an idea he has since back-tracked on since he is a tall fellow and he felt somewhat cramped when he took away some of the room for his legs). No matter. This still shows the room for experimentation in the Classic Moth class with probably the most roomiest interior going in the Classic Moth. The trade-off? The tiny gunwhales are definitely not a comfortable hiking platform. It looks like it was a gusty northwester as I was sailing upwind towards the U.S. Naval Academy. Nobody had invented flat leg hiking yet! From the Earwigoagin archives; a few of the Laser posts featuring the blogmeister. 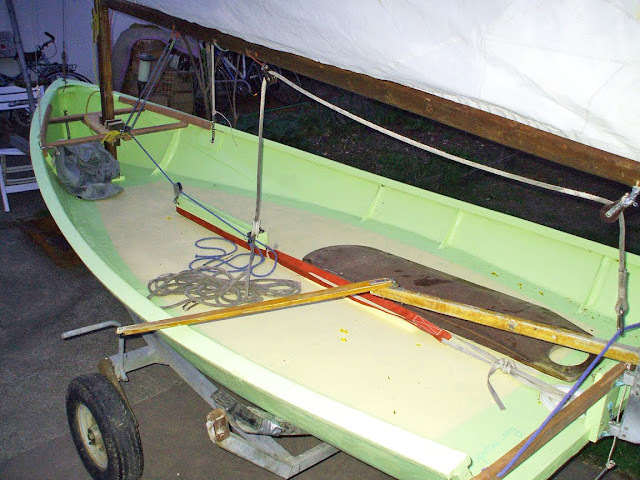 The previous photo is a start of the Shannon One Design, an Irish, 18 foot, clinker, cat-rigged traditional dinghy that is raced primarily out of Lough Derg on the River Shannon. 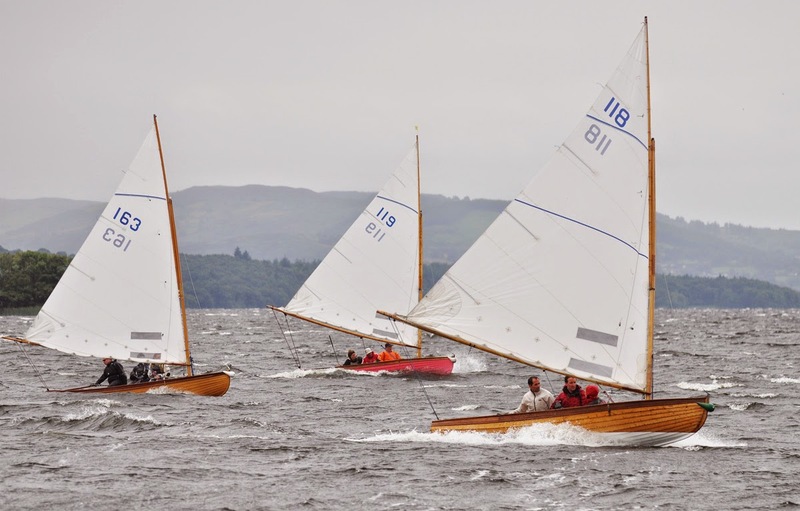 The class came about when, in 1920, sailors on the River Shannon decided to ditch their motley assortment of 18 foot sailing/rowing open boats and settle on a design by Morgan Giles. These Shannon One Design's are very quick in a breeze. In looking up the Shannon One Design, I came across the BBC show, "Three Men in a Boat", which seems to be a watery takeoff of the hit BBC car show, "Top Gear"; both shows featuring three guys swimming in back-and-forth witty banter . 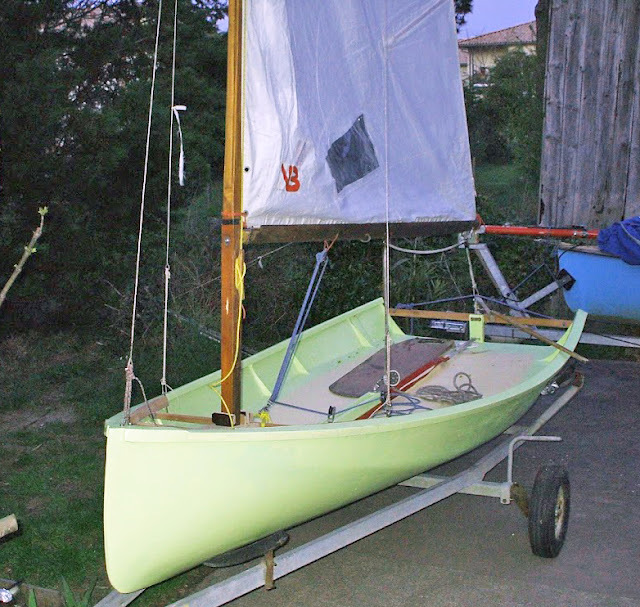 "Three Men in a Boat" did a show on cruising the Shannon and featured the Shannon One Design (seen at about 19 minutes in on the following YouTube). The Wikipedia page for the Shannon One Design can be found here. Music Whenever: Heifervescent "Billy Comes Home"
A boppy rock tune - it's got a little of the late 60's Monkeys vibe to it (and to tell you the truth, I liked the Monkeys). I guess this band isn't into putting up a produced music video but it's the music that counts. I've got no money but I'm happy this way so hey hey! I wondered how often I used the adjective "boppy" to describe a tune. It turns out not that often. Click here to see the tunes I described as boppy. George Steer's 1856 design "Laura"
In 1856, the last year of his life, George Steers, the designer of America, designed a small 24' racer for Harry Latrobe Roosevelt of Skaneateles N.Y. Named Laura, this Steer's racer would spend her entire career on Skaneateles Lake. On Christmas Day, 1936, after being hauled for the last time, Osgood R. Smith, John Barnes, and Art Emerick would measure Laura on the beach. 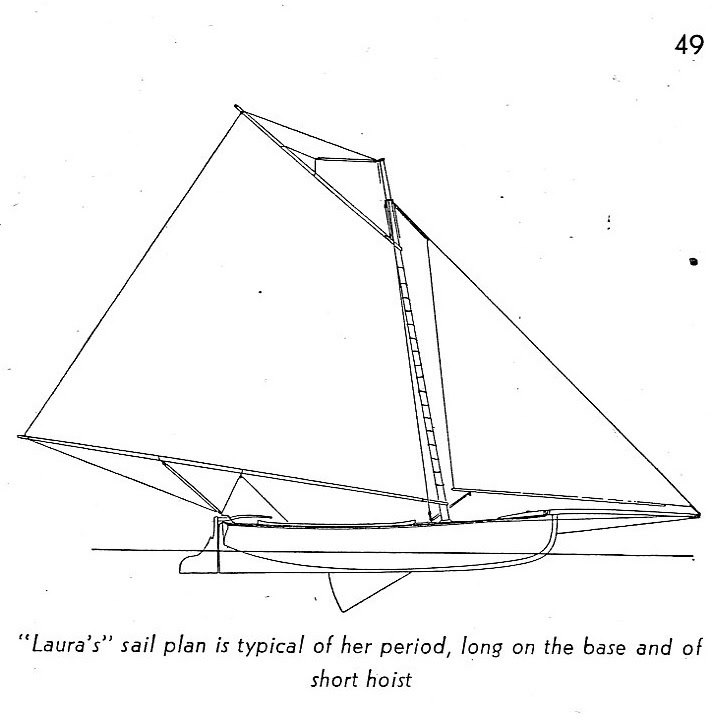 Eight years later, Osgood R. Smith wrote an article on Laura in the August 1944 issue of Yachting magazine and included the lines they had assembled. Laura provides a glimpse of how the New York designers were moving the lines of the New York oystering workboat into a recreational racer. 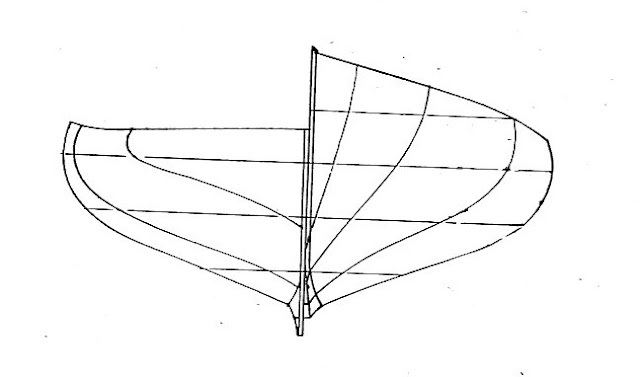 (See also Chris Thompson's article on the 1853 Una design by Bob Fish). We see the basis of form that would be tweaked, some fifteen years later, into the all-out Sandbaggers of the 1870's. Compared to Sandbaggers, the George Steer's Laura is a wholesome hull of moderate proportions though we can see the fine bow and the tucked-up aft rocker of the Sandbaggers. There is no record of Laura needing sandbags to be raced. Laura's sections show a fair bit of tumblehome. The beam is not excessive. This side view has the stern lopped off because the copier distorted the stern as the page made it's way down into the binding of the book. 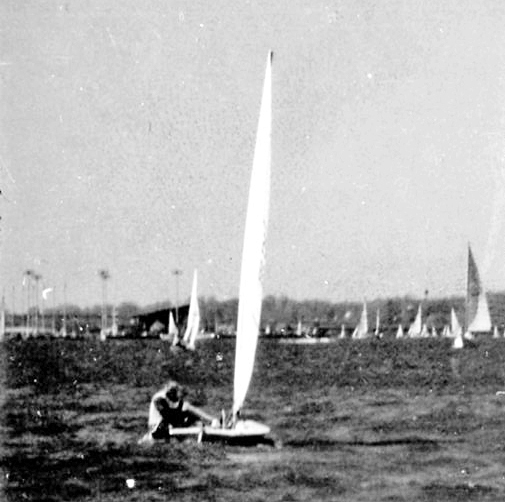 My night of Sandbagger sailing.